Test: Made on average skill using the default setting on my computer [ AMD64 - 2Gb Ram - GEforce 6 128 Mb] no slow down and perfect render of effect and graphics . Cost: it can now easily be find for less than 5 $/€ in some second hand store or for a little bit more as classic retail version in megastores . 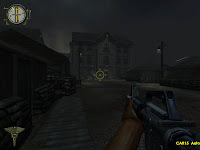 The game puts the player in the role of Dean Shepard, a black Marine stationed in Vietnam in 1965. With this scenario come many references to the problems of racial segregation and this is enhanced by the letter conversation between father and soon about the small descent to hell of is his young brother. 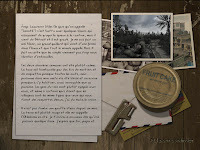 This letter conversation and the change of objective during the mission (not only saving your life but also the one of your brother) add certainly a parallel immersing storyline to the classic and simple rush trough missions. 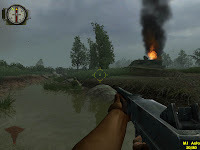 Through 12 missions (53 maps), 2015 will try to immerse you into the Vietnam war with some interesting touch like the cutscenes performed with a movie 16/9 size (screen here below), the story behind at every loading mission and even some real movie archive. They try really to put you into the adventure. 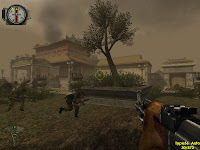 The mission design is what I expected from the creator of Medal of Honor : Allied assault with well put together environment with all what was put already in advance before through the Vietcong serie (sadly for 2015 they came after this first visit of Vietnam through FPS that was really a success for me) they visited the same type of environment with some really good highlight like the tick grass where search for enemies isn’t that evident and the impressive explosion and fire effects. 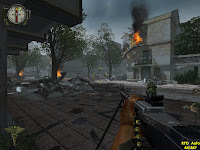 But those stuff felt a bit light and didn’t clean away my taught of replaying just another Vietcong addon with some better texture. The location of all mission where quite interesting and not to devoted to jungle or underground experiences with a good twist between day and night sun and rain I would have expected some more vehicle mission that was mostly limited to the boat one. The squad experience is always present and even if they don’t really act as good as in COD, squad mission is certainly pushing you to give the best that you can. Also what was a good point was that the mission were well organized as a ‘run to escape’ war and not a run for glory this taking in account that this war was a real down turn for the United States of America. The AI except there sometimes erratic behaviour, are well designed and have really a realistic layout not as much as the weapons but still enjoyable, but one more this doesn’t really add a positive value to what was done before. 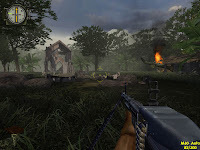 Like for the Vietcong series to find some munitions or feature you will need to search bodies but this time they will quite fast disappear, the collaboration between you and your squad isn’t always that efficient and this especially when you receive order to follow ‘Mr Brown’ but the game doesn’t feature the soldier name as in COD series…also the objective to achieve through the direction you need to follow (compass) can make you turn around for a certain time because you missed something without knowing what to do, the cherry on the cake is certainly the fact that you cannot save but need to pass a certain point to have an autosave… this can make some experience really frustrating to the lack of some autosaving (you will see what I mean trough the ambush mission (7th) where on the way back to the camp you will never encounter an autosave…it took me around 10 time to finish this one… the bandage system was in comparison a good additional feature where you can hide yourself recover the wound and restart the fight. 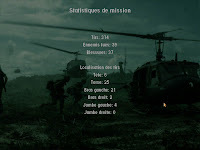 The challenge was well present and adds some epic combats that will be appreciated when finished, but one more time there wasn’t enough destroying objective mission (putting bombs) or timed mission like in COD or Vietcong where you need to hold a position with a counter decreasing. In conclusion: I had a good time but felt really disappointed at the end of this game through is frustrating saving system is missing originality the game just felt off with no real replay value like previous release certainly have…For a game that came out in 2004 there was never an interested community that grow up with the game, no planetMenofValor, no real covering website (or the one that was died quite fast) and I think that there was no custom single player mission ever done. 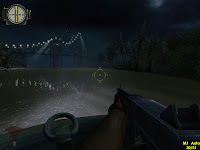 The only good point is now that you can easily find this game for a quite interesting prize and give it a try but be aware that Men of Valor will never be as good as it’s predecessor (MOH, COD and Vietcong).